If you just bought a brand-new epilator, then you should learn how to clean an epilator to maintain its function and keep your skin as healthy as possible. Although most epilator manufacturers include instructions for epilator cleaning, they’re not always as detailed as you’d like them to be. Fortunately, it’s easy to clean an epilator once you know the proper steps to take and get some experience doing it. This guide will teach you how to clean your epilator in 9 simple steps, while also giving you some helpful tips for storing and maintaining your epilator to keep it free from bacteria and working efficiently for years to come. A clean epilator is necessary for you to avoid having bacteria form on your epilator. If you fail to remove hair or keep the epilator free from dead skin cells and dirt, you’ll put yourself at risk for infections when you use the epilator. 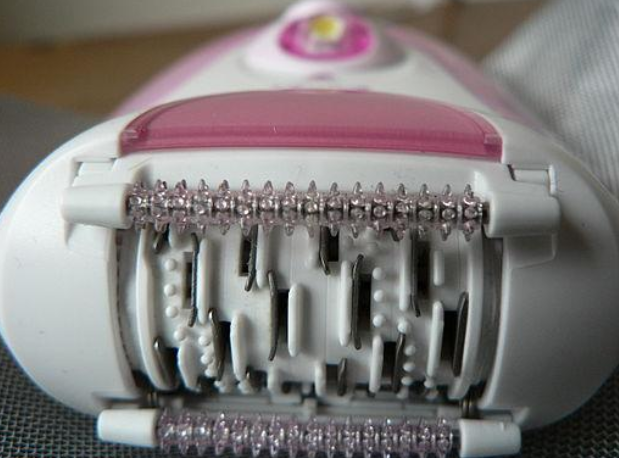 Most epilator manufacturers will include instructions for cleaning your epilator properly. Since not all epilators are designed the same way, it’s crucial that you read these instructions to get specifics steps for your epilator. The instructions will also include contact information for the manufacturing company, just in case you run into any issues or have questions about how to clean your epilator. It’s easy to misplace your original packaging and paperwork, though, which is why we’ve created this general guide to teach you proper methods of epilator cleaning that will work with most models. To get a clean epilator, you’ll need to remove the epilator head. The head is the part that brushes against your skin because it contains the tweezers that remove hair. As you can expect, the head is where most bacteria live on your epilator, so it’s crucial that you know how to clean an epilator head. For sanitary purposes, most manufacturers make epilator heads easily removable. Most epilators have buttons on either side of the head that you can press to release the head from the body of the epilator, much like you can do with a razor with disposable blade cartridges. Hold the head in one hand and press the buttons with your other hand. The head should release from the body. You may want to use rubber gloves during this step and while cleaning your epilator head to avoid getting cut by the tweezers. Some epilators come with a small brush with long, flexible bristles that are perfect for removing hair from the head and where the head attaches to the body. If your epilator did come with this type of brush, use it to move through each groove in the head and work your way around all the tweezers. The more tweezers your epilator has, the more care you’ll need to take to ensure you get into every nook and cranny. If your epilator didn’t include a cleaning brush, then you can substitute it for a toothbrush with soft bristles. This should be a new toothbrush or one that you use solely for cleaning your epilator. Work the toothbrush over and around the tweezers and the epilator head and then gently swipe it over the part of the epilator where the head attaches to the body. A cleaning brush or toothbrush usually make it easy to clean an epilator head, but depending on your model, you may still have some stubborn hairs that get wrapped around the tweezers or stuck between them. In this case, you can use a can of compressed air. You can typically find these in the electronics section of your local department store. Use the attached hose to direct the air between the tweezers where you see stuck hair. Compressed air can also be helpful in removing hair that gets lodged beneath the head where it attaches to the epilator body. The force of the air can also remove dead skin cells you can’t see with the naked eye, so it can offer an extra layer of protection to rid the epilator of bacteria. Once you’re certain that you’ve successfully removed the hair from your epilator head, you’ll need to clean the head to remove any remaining dead skin cells and bacteria that can quickly take over your epilator. Again, be sure to check your manufacturer’s recommendations for cleaning the epilator before using any cleaners or soaps to wash it. Most epilators are safe to clean under warm, running water and usually don’t require any soap or detergent. Keep the head under the water for a couple of minutes, ensuring that water runs over all the tweezers. Be sure to flip the head over and allow the water to wash the underside too. This part is one that people often forget to wash, but it can harbor bacteria, hair, and dead skin cells just like the top of the head can. Now that you know how to clean an epilator head by removing hair and washing it, it’s time to sanitize the head to neutralize bacteria and prevent bacterial growth. Place a drop or two of antibacterial dish soap into a bowl of water deep enough to cover your epilator’s head. Allow the head to sit in the water for two or three minutes and then rinse with cold water. Use a cotton ball soaked in rubbing alcohol, which can kill bacteria on your epilator head. Run the cotton ball carefully over the tweezers and head to kill any remaining bacteria and sanitize the head. Some epilators come with a sanitizing system that you can use to conveniently kill bacteria and prevent germs from finding their way onto your epilator while it stores. If yours does come with one, you can use this system according to the manufacturer’s instructions instead of sanitizing the epilator yourself. It’s important to let your epilator head dry completely after washing and sanitizing it. If you don’t allow ample drying time, your epilator tweezers may rust, which can threaten the safety of the device. A wet epilator will also be likelier to harbor bacteria than a dry one. It can be challenging to dry an epilator with a towel because the tweezers will snag it. Instead, opt for air-drying your epilator. Most epilators will need several hours to dry, but it’s preferable to wait at least a day or two for all moisture to evaporate from the tweezers. Your epilator may have come with a storage unit that can keep it away from dust, germs, and bacteria when it’s not in use. These storage units can be bags, hooks, or upright storage devices. If your epilator didn’t come with a storage unit, you could lay it down on a clean, dry towel to dry, ensuring that you keep it away from the sink, toilet, and anywhere else that it may encounter water and bacteria. If your epilator did come with a storage unit, make use of it! These units are not only a convenient way to keep everything for your epilator in one place, but they can also safeguard it against germs. Be sure only to store your epilator once you’re positive it’s dry. You should also check the storage unit regularly to make sure that it’s also clean and a safe place to store your device. If at any point you notice that you can’t get the epilator head as clean as it should be, or if any parts of the head look worn out, rusted, or damaged, it may be time for a replacement. It’s a good idea to get into the habit of checking your epilator and head every time you clean it, just to be sure. Most manufacturers have information about the warranty and replacement parts included in the original packaging. If you can’t find that information, check your manufacturer’s website. With the right cleaning and maintenance techniques, you should get several years out of your epilator’s head. Cleaning an epilator isn’t difficult, but it’s important that you’re meticulous about doing it right every time you use your device. Without the proper cleaning and drying techniques, you’ll risk damaging your epilator or harming your skin. Epilators require thorough cleaning to ensure that they’re free from hair and bacteria to prevent infections from their use. Use a cleaning brush to remove hair from the epilator’s head, and then wash, sanitize, and dry the head thoroughly before storing your epilator. We hope this serves as a handy resource to remind you how to clean an epilator effectively to maintain its performance and safety for years to come.